He needs to anodize the shocks black. HA! Sometimes it does get hard to see late in the evening after my eyes are tired from the flourescent lights at the track...when driving my B4 which has the same paint scheme, that is. Last edited by foolio; 01-31-2006 at 07:06 PM. Where are people mounting the 2 aluminum braces? I noticed that people are getting 2 (1 for the front and 1 for the rear). However, are they both going in the front portion of the car (i.e. one is front front and other is front rear) or is one going in the very front and one in the very rear of the car (ie. front front and rear rear)? Any help would be much appreciated. I dis-agree. I have personnaly never broke a stock plastic front arm front brace, but I did break the front rear arm brace. I put them both on my car. Also tightened up the excessive play in the arms. So, yes, the front arm front brace and the rear arm front brace. hmm.. guess I have been corrected. Cornerspeed: you race at SoCal right? when are you racing there next? I've only raced there recently once about a month ago. Don't know when I'll make it up there again. Well, I will be there Saturday racing on-road though. Also any one looking for the braces ,they are dwindleing fast ,so if you need one you best not procrastinate. 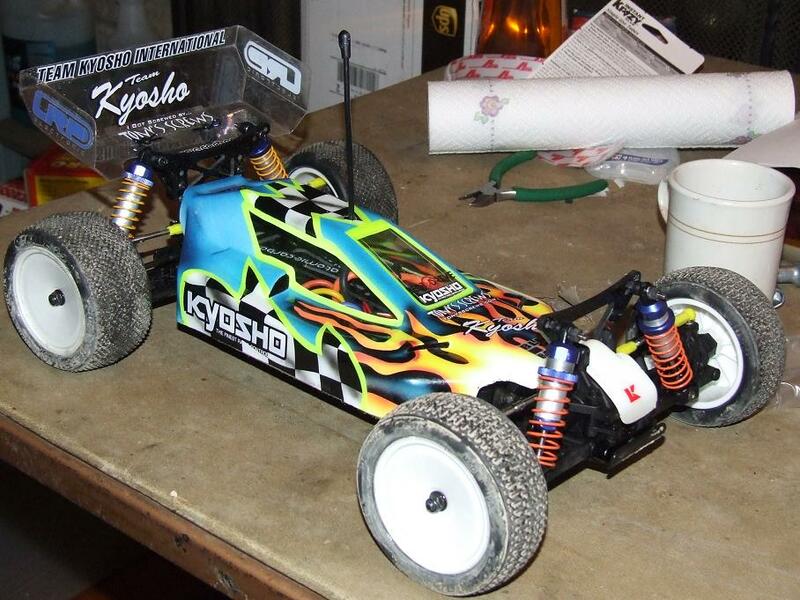 hey guys my name is Brent and i am new to RC-tech. figured i'd jump in the forum that i best fit. i am somewhat of a new ZX-5 guy that does the best i can. i an not a top of the pack racer but i am out for a good time, and to be Dayton and Mike's parts supplier...sup Dayton by the way. good luck this weekend. gimme a call and let me know how this go. i attached some pics of my ZX-5 below. Hey Corky, hit me on direct connect when you get a second. FRONT: Kyosho #2 pistons ( stock ), Losi 30wt oil, Losi dark Green front buggy springs, 1-C camber link ( farthest outside whole on the tower block ). -1 camber, 0 toe in. Shock inside on the A-arm, middle whole on the tower. 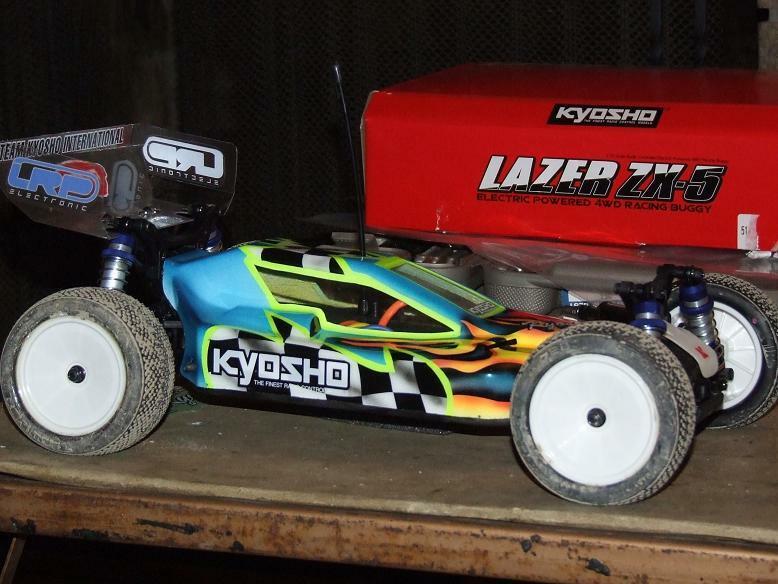 REAR: Kyosho # #2-b? 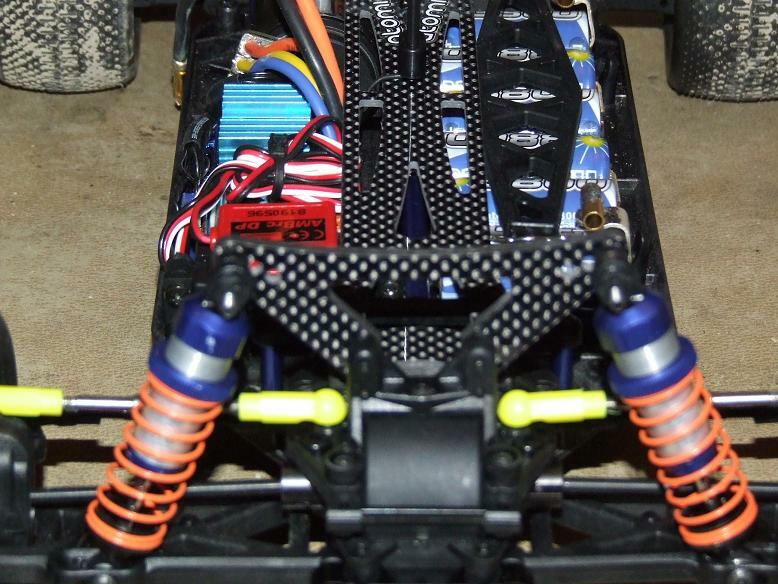 ( stock) ( I don't have my manual on me, the stock rear pistons ) pistons, AE 35wt oil, Losi Pink rear buggy spring, Stock camber link on the tower block, middle on the Hub, Hubs forward, Shock on the inside on the A-arm, second whole down from the top on the tower. 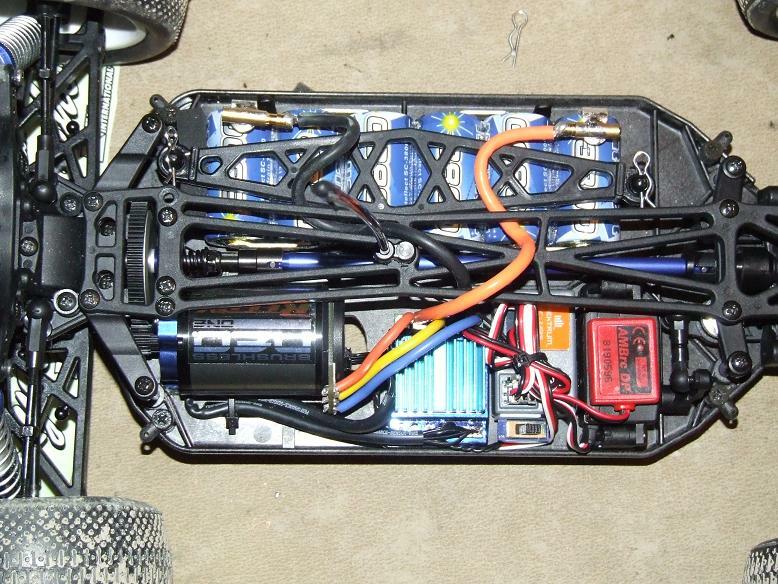 Battery in the rear, Front One Way, ride height set at bones level. American Custom Engineering is currently in the process of developing a carbon fiber chassis for the ZX-5. We want to gauge the the interest before we commit to the production of this product. The chassis will be CNC machined out of 2.5mm or 3mm carbon fiber. We are looking at 2 different types of CF. Regular 0-90/0-90 style or Quasi-isotropic. The Quasi grade is, torsionally, more rigid than 0-90, but is it necessary to have more torsional ridigity. The down-side to the Quasi is it's more expensive, which means the chassis will be more expensive. From what we can tell so far, the 0-90/0-90 works great. Let us know what you guys think, and post it here, or check out A.C.E. web site at www.acerodparts.com and leave your comments there. Thanks. rcdude69, sounds like a great idea, but I think for most people it will come down to the price. Right now, the stock chassis is just fine. It seems to suit the car well and causes no handling issues from what I can tell. Overall, the car is extremely light and I don't know how much extra weight people are looking to lose with a new carbon fiber chassis. Lastly, a new stock chassis is 26$. That is very inexpensive to replace a broken chassis. If your carbon fiber one was 50$ or so and wouldn't break, I'd consider. JMO. Here's an updated ZX5 editable set-up sheet I made. Just let me know what else it needs. Last edited by Tres; 02-01-2006 at 05:57 PM. All times are GMT -7. It is currently 11:42 PM.